It’s called the “summer slide” – the tendency for students, especially those from low-income families, to lose some of the achievement gains they made during the previous school year. Lake Worth West Community Center is offering summer reading and other educational programs to children and their families so they can continue practicing essential reading skills learned during the school year. The summer slide is a very real phenomenon. Research shows that most students lose about two months of grade level equivalency in mathematical computation skills over the summer months, according to National Summer Learning Association. In addition, low-income students lose more than two months in reading achievement. Surveys of teachers also found that summer learning loss could be reduced, even eliminated, if students participated in a summer learning program. As a result, Lake Worth West Community Center is providing a summer reading program starting June 13 through August 3. The eight-week classes for children from first grade to third grade go from 10:30 am to 12 pm on Mondays and Tuesdays. The summer reading program for mothers is from 10:30 am to 12 pm on Wednesdays. These classes provide tips and strategies to support and encourage children to achieve their reading goals. Books and incentives will be given to all participants, too. Also, teachers, librarians and school teen coordinators will discuss topics of interest to children and their parents. In addition, during the summer months, the center will offer the “Raise Me Up” class which encourages interaction between parents and their children. Instructors will teach parents about communication, fine and gross motor skills, building social skills, and much more. They will also go over site words for children to learn and discuss the importance of regular school attendance. During this time, parents will be able to do ASQ-3 Screening for their children to identify early development or behavioral problems in children who are 2 months to 5 years old. So this summer, it’s fine for kids to be carefree and be happy just being kids. But it’s also vital to access educational opportunities. Call the Lake Worth West Community Center at 561-649-9600 to learn more about our summer reading program. Lake Worth West Community Center offers many classes for young children and their parents. 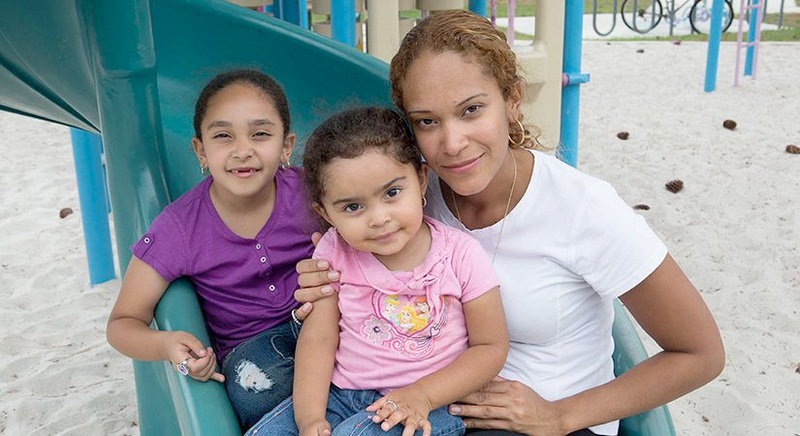 These are part of Children Services Council of Palm Beach County’s BRIDGES program, which stresses positive parenting. Here’s what one of those classes is like. It’s a valuable lesson for Saory who is refining her motor skills and learning to socialize in preparation for pre-school. And it’s also a good lesson for Yushiry, who is 28 and originally from Mexico, as she develops her parenting skills. They are attending the “Exploring Our World” class at BRIDGES at Lake Worth West at the Lake Worth West Community Center. The class is one of many the center provides for families from Central and South American countries, as well as local families, so they gain the skills needed to raise their children in Palm Beach County. In addition to regular classes, the center also offers ASQ-3 Screening to determine if children are at risk for developmental delays. During the morning class Gonzalez is attending, close to 20 other mothers and their children are creating their own “first books” full of first words, first sentences and first pictures of all their favorite things. They are also doing arts activities, reading books, and listening to instructor Veronica Callejas explain the importance of parental engagement with children. Create a stable, supportive, peaceful home. Build positive relationships with your children. Deal clearly, calmly and consistently with any problem behavior. Encourage behavior that you like. Know what is reasonable to expect from your children and yourself. “I tell her we’re going to ‘school’ and she just lights up. She loves it here,” Gonzalez says. Fabienne Brizeus also enjoys bringing her children to the classes. On the same morning class, she, too, is sitting with her 3-year-old daughter Johanna and also working on their “first book.” Her son, Joshua, 2, is in another room playing with other children – a big step for him because, until recently, he had been clinging to Brizeus every time she leaves him to go to work as a manager at a McDonald’s. Learn more about our Early Beginnings programs here and our Adult programs here.